Thank heaven for little girls, for they blossom into beautiful, blushing brides. These delicate rosettes were inspired by the innocence and purity of youth. 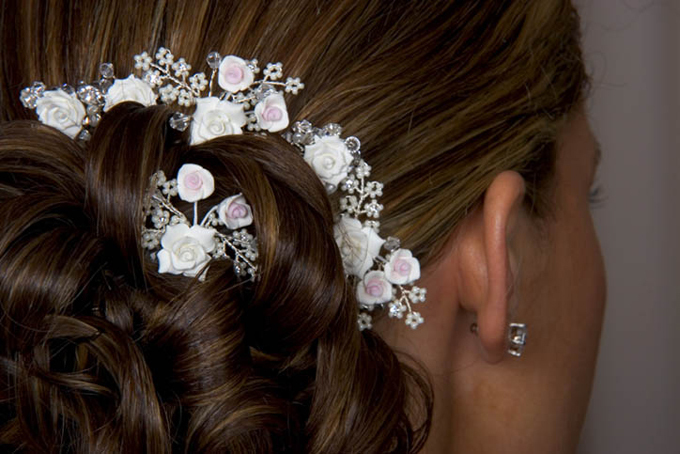 Our Gigi, the porcelain floral hairpins accentuated with crystal and ivory beads, are handcrafted on jewelry wire, to help inspire creativity. The beauty of these pins is in their versatility. Wear them separately, or shape them into an intricate patterns. Upon request, some porcelain roses can include pink accents (as shown), or roses can be all ivory.